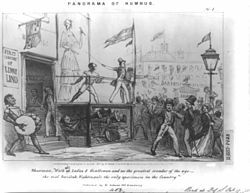 Barnum became a small-business owner in his early twenties and founded a weekly newspaper before moving to New York City in 1834. He embarked on an entertainment career, first with a variety troupe called "Barnum's Grand Scientific and Musical Theater", and soon after by purchasing Scudder's American Museum which he renamed after himself. He used the museum as a platform to promote hoaxes and human curiosities such as the Fiji mermaid and General Tom Thumb. In 1850, he promoted the American tour of Swedish opera singer Jenny Lind, paying her an unprecedented $1,000 a night for 150 nights. He suffered economic reversals in the 1850s due to bad investments, as well as years of litigation and public humiliation, but he used a lecture tour as a temperance speaker to emerge from debt. His museum added America's first aquarium and expanded the wax-figure department. Barnum became known as the "Shakespeare of Advertising", due to his innovative and impressive ideas. He knew how to draw patrons in, by giving them a glimpse of something that had never been seen before. He was, at times, accused of being deceptive and promoting false advertising. In December 2017, an American film titled, The Greatest Showman was released. This musical was based loosely on the life of Barnum (portrayed by Hugh Jackman). Directed by Michael Gracey, The Greatest Showman shows PT Barnum as a young boy with a flair for entertainment. The young Barnum then grows up, marries his childhood love (Charity Hallet), starts the circus, and tours with Jenny Lind. The film was released seven months after the Ringling Bros. and Barnum & Bailey Circus permanently dissolved. 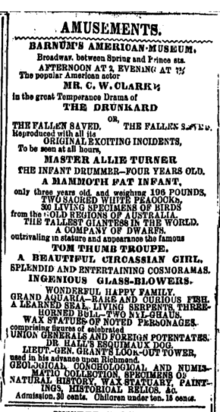 Karl King, who played in Barnum's circus band, composed Barnum and Bailey's Favorite. ^ Barnum, Phineas (1888). "The life of P.T. Barnum". Ebook and Texts Archive – American Libraries. Buffalo, N.Y.: The Courier Company. p. 237. ^ a b Rogak, Lisa (2004). Stones and Bones of New England: A guide to unusual, historic, and otherwise notable cemeteries. Globe Pequat. ISBN 978-0-7627-3000-1. ^ Freed, Robin. "Joice Heth". MA candidate, University of Virginia American Studies Department. Archived from the original on May 18, 2002. Retrieved April 8, 2007. ^ Schweitzer, Marlis. "Barnum's Last Laugh? General Tom Thumb's Wedding Cake In The Library Of Congress." Performing Arts Resources 2011; 28.: 116. Associates Programs Source Plus. Web. 8 Dec. 2012. ^ Stabile, Susan M (2010). "Still(Ed) Lives". Early American Literature. 45 (2): 371–95. doi:10.1353/eal.2010.0020. ^ Martin, Gary. "'We are not amused' - the meaning and origin of this phrase". Phrasefinder. ^ "Peale's Philadelphia Museum - Encyclopedia of Greater Philadelphia". philadelphiaencyclopedia.org. ^ Mosier, Jennifer L (1999). "The Big Attraction: The Circus Elephant And American Culture". Journal of American Culture. 22 (2): 7. doi:10.1111/j.1542-734x.1999.2202_7.x. ^ a b "P. T. Barnum". geni_family_tree. Retrieved December 3, 2018. ^ a b ROY., RICE, EDWARD LE (2016). MONARCHS OF MINSTRELSY, FROM DADDY RICE TO DATE (CLASSIC REPRINT). FORGOTTEN BOOKS. ISBN 978-1332446100. OCLC 978655054. ^ Washington, Harriet A. (2006). Medical Apartheid. New York: Doubleday. p. 86ff. ISBN 978-0-385-50993-0. ^ Washington, Harriet A. Medical Apartheid The Dark History of Medical Experimentation on Black Americans from Colonial Times to the Present. Paw Prints, 2010. ^ a b c 1935-, Saxon, A. H. (1995). P.T. Barnum : legend and the man. Columbia University Press. ISBN 978-0231056878. OCLC 60224094. ^ a b Barnum, Phineas (1888). The life of P.T. Barnum. Ebook and Texts Archive – American Libraries. Buffalo, N.Y.: The Courier Company. p. 237. ^ a b c "The Great Showman Dead". The New York Times. April 8, 1891. Retrieved July 21, 2007. Bridgeport, Connecticut, April 7, 1891. At 6:22 o'clock to-night the long sickness of P.T. Barnum came to an end by his quietly passing away at Marina, his residence in this city. ^ W., Cook, James (2001). The arts of deception : playing with fraud in the age of Barnum. Harvard University Press. ISBN 978-0674005914. OCLC 876342914. ^ "Planned Parenthood League of Connecticut – Today in History"
^ "P.T. 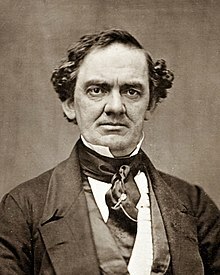 Barnum, Justice Harlan, and Connecticut's Role in the Development of the Right to Privacy". Federal Bar Council Quarterly. December 13, 2014. Retrieved May 9, 2018. ^ "Connecticut and the Comstock Law". Connecticut History. Retrieved May 9, 2018. ^ "Planned Parenthood, The Pill, and P. T. Barnum". Huffington Post. September 18, 2015. Retrieved May 9, 2018. ^ Barnum, P.T. (1883). Struggles and Triumphs; Or, Forty Years' Recollections of P.T. Barnum. Buffalo, N.Y.: The Courier Company. p. 297. ^ Miller, Russell (July 16, 2008). "Light on the Hill, Vol. 1". The Archives at Tufts University. Tufts University. ^ "Get to Know Tufts". April 22, 2010. 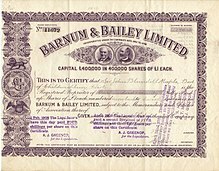 ^ Barnum, Patrick W. "A One-Name Study for the Barnum/Barnham Surname: Notes for Phineas Taylor Barnum / Charity Hallett". Barnum Family Genealogy (official website). Retrieved December 10, 2017. ^ a b "Charity Hallett (1814–1873)". Ancestry.com. Archived from the original on December 10, 2017. Retrieved December 10, 2017. CS1 maint: BOT: original-url status unknown (link) Additional archive on December 10, 2017. ^ Barnum, Patrick W. "A One-Name Study for the Barnum/Barnham Surname: Notes for Nancy Fish". 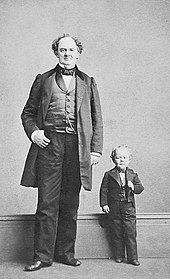 Barnum Family Genealogy (official website). Retrieved December 10, 2017. ^ "Marina Park Historic District, Bridgeport City, Fairfield County, Bridgeport CT, 06604". www.livingplaces.com. ^ "Barnum Statue Unveiled". The New York Times. July 4, 1893. ^ Slater, Chuck (November 18, 2001). "A Coin True to Barnum, Controversy and All". The New York Times. ^ Michael Knight, "Barnum Festival Revels in Hoopla and Humbug", The New York Times, June 20, 1975, p. 35. ^ Homayon, Marietta (July 8, 2004). "Town gets grant to promote Barnum". The Dansbury News-Times. ^ FitzGerald, Eileen (July 15, 2010). "Barnum's Ivy Island to be showcased at celebration". Danbury News Times. ^ "Charity (Hallett) Barnum (1808-1873) | WikiTree FREE Family Tree". www.wikitree.com. Retrieved June 11, 2018. ^ Mansky, Jackie (December 22, 2017). "P.T. Barnum Isn't the Hero the "Greatest Showman" Wants You to Think". Smithsonian. Retrieved June 30, 2018. ^ Abrams, Natalie (June 14, 2017). "Legends of Tomorrow casts Billy Zane as P.T. Barnum". Entertainment Weekly. Retrieved June 15, 2017. ^ Cachero, Paulina (December 20, 2017). "'The Greatest Showman': 8 of the Film's Stars and Their Real-Life Inspirations". Hollywood Reporter. Retrieved September 4, 2018. ^ Kellem, Betsy Golden (December 22, 2017). "The Greatest Showman: The True Story of P.T. Barnum and Jenny Lind". Vanity Fair. Retrieved September 4, 2018. ^ Williams, T. (2000). A streetcar named desire and other plays. London: Penguin.